For a town with such exciting young athletes as Robert Griffin III , Bryce Harper and Stephen Strasburg, it is only fitting, I suppose, that it would also be saddled with one of the historically worst teams in all of sport- the Washington Wizards of the National Basketball Association. The Wizards host the Portland Trailblazers this evening, expected to lose their 13th straight game of the season- still looking for their first victory. They are the last team in the league left looking for a win. In fact, no other team has less than three. The record we are shooting for here is 18 consecutive losses to start a season, last accomplished by the New Jersey Nets. Fans of Awful can appreciate the incredible depths of mediocrity and failure that we are so fortunate to behold here in the nation’s capital. These are the 1961 New York Mets. This is potentially historic stuff. Over at ESPN, they’re now referring to the Wizards as the Washington Generals, the team that was the perpetual doormat for the Harlem Globetrotters. Except, of course, they were designed to be bad- the Generals were supposed to be bad. The Wizards still try. They’ve lost a pair of overtime games in excruciating fashion recently. The market for Wizards tickets says it all. If you check on Stub Hub right now for tickets to Wednesday night’s game against Portland, mezzanine level seats start at one dollar. Several dozen more are available at $1.44, $1.69, $1.75, $1.90. Consider, for a moment, that the price for one imported beer at the Verizon Center is $8.50. Yes, you could buy SIX Wizards game tickets for the price of ONE beer. 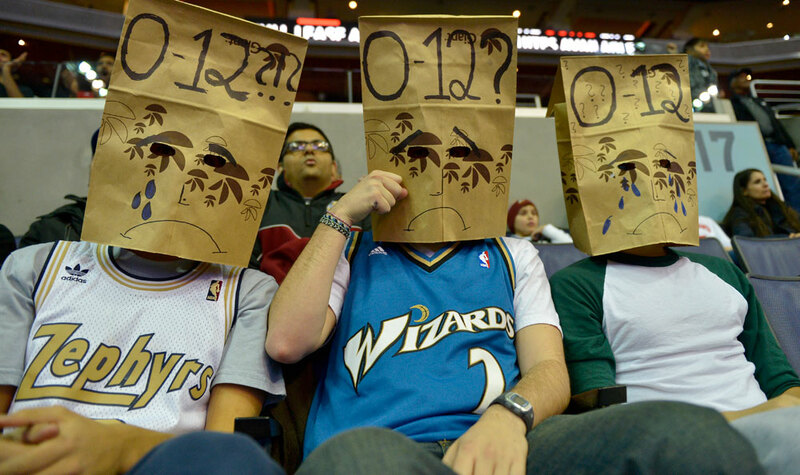 It’s so bad that a frustrated Verizon Center employee tried to get several fans to take off the paper bags they were wearing over their heads- only to be told by his supervisors that it’s perfectly allowable as long as there’s nothing untoward written on the bags themselves. So the fans promptly placed the bags over their heads again. It is too painful to go into the history of the team but, in a nutshell, it involves star players bringing guns into the locker room and getting season-long suspensions, lowlight reels of players going back on defense unaware their team has just gone on offense, players going for shots and accidently running into each other, players throwing the ball off the backboard, making selfish dunks and then celebrating- when they were more than 20 points behind. There have been historically laughable trades and draft selections; just too many to bother to go into much detail on. For hope, the Wizards can turn to the very New Jersey Nets team that set the standard for opening season futility. They are now the Brooklyn Nets. They are fighting for first place in their division against the New York Knicks and selling out their arena every night they play. But for now, historic futility should be every Wizards fan’s fondest hope. Otherwise, failure to achieve historic failure would be wholly unacceptable and an unspeakably horrible form of failure, worse even than historic failure. Imagine they lose 17 straight and then with glorious infamy staring them in the face, they accidently win a game and end up with the 2nd worst start in history. How truly demoralizing that would be.